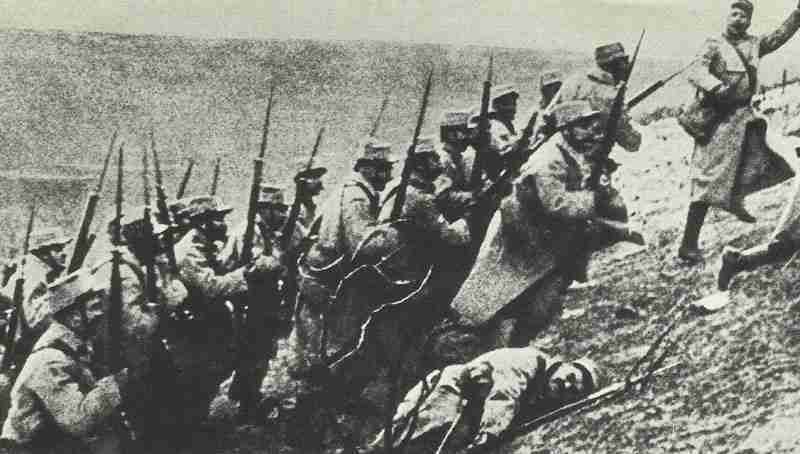 August 6, 1914 – BATTLES OF THE (FRENCH) FRON­TIERS. French infantry attack in the first days of the war, in the attempt to retake Alsace-Lorraine. The government declares war on Germany. Belgium: General Erich Ludendorff of the German Second Army wins great fame in his homeland by leading 1,500 troops through part of Liege‘s defensive ring of forts to establish a lodgment that threatens the city’s Belgian garrison. However, he is cut off until the 10th. French Sordet Cavalry Corps crosses into Belgium with King’s permission, gets to within 9 miles of Liege. France: BATTLES OF THE FRON­TIERS (ie French frontiers) begin, until August 24. Germans invest Longwy fortress on Luxembourg border until August 28. Poland: Two new Russian armies (Ninth & Tenth) to form near Warsaw and Second Army East Prussia invasion widened. 400 men of Colonel Pilsudski’s Polish Legion invade, he follows on August 8, reaches Kielce 70 miles northeast of Cracow on August 12. Serbia: Austrian attack on Obrenovats in river Sava loop west of Belgrade repulsed with loss of guns. North Sea: Kaiser orders German Fleet to stay on defensive; U-boats and torpedo boats to carry out limited offensive operations.14 U-boats begin 9-day 350-mile scouting cruise. Atlantic­: German SS ‘Schlesien’ captured by cruiser HMS ‘Vindictive’ off Cape Ortegal. RN cruisers capture 4 German merchant­men. In South Atlantic German cruiser Dresden captures but releases 3 British merchant ships, sinks first one (August 15) 180 miles northeast of Pernambuco, Brazil, blows up another (August 26). Indian Ocean: The ‘Königsberg’, a German light cruiser, attacks and sinks the British light cruiser ‘Pegasus’ off the port of Mombasa. The German warship sailed from Dar-es-Salaam on 31 July; its role is to interdict British commerce in the Indian Ocean. The British move to deal with the threat posed by this German raider and the ‘Königsberg’ is forced to seek shelter in the Rufiji River, German East Africa, on October 30. Mediterranean: ‘Goeben’ and ‘Breslau’ leave Messina for Constantinopel. Cruiser ‘Gloucester’ shadows them. Caribbean: Cruiser ‘Karlsruhe’ escapes Cradock’s cruisers ‘Suffolk’, ‘Berwick’ and ‘Bristol’ after moonlight action (no hits) with latter. Western Front: Army Zeppelin L6 makes abortive bombing raid on Liege, holed by Belgian fire and crashes near Bonn. In Germany a special tripartite conference from military, ‘Reichstag’ and industry promise 200 airframes and 170 aero engines per month from mid-August. German Togo: Captain Barker summons to surrender, rejected (August 7) but Lome and coast evacuated. South East Cameroons: ­158 French occupy Bonga and Singa on border before Germans know of war. Cyrenaica: First of 6 rebel attacks on Italians until August 30 and a caravan wiped out on August 26. 4 more attacks in September as Fezzan region rebels. Turkey: German Ambassador gives Turkey letter of guarantee including war compensation, Aegean Islands if Greece enters war, expanded eastern borders with Muslims and Russia and no peace before foes cleared from Turk land. Britain: Britain asks Australia and New Zealand to seize German radio stations in Pacific. Britain asks also Japan for help. Asquith outlines ‘infamous proposal’ and war aims to Commons which votes £100 millions war credit, 500,000-man Army and Royal Navy 67,000 more men.